According to the article linked above, scientists are eagerly awaiting the confirmation of a new Solar Cycle! The current solar cycle is in a diminishing state of activity, the article reports, and scientists have already discovered signs that we may be entering a new cycle of the sun's sunspot/magnetic output very soon. Amazingly, the scientists watching the data from the SOHO sun-observing sallelite are reportedly predicting a peak in this coming solar cycle........around the year 2012!! Read the article! This supports the beliefs of those of us attentive to the Mayan (and other) prophecies relating to the transmission of energies through alignment to the galactic center of the Milky Way. As many of us here know, the massive energy output in the form of solar wind, EM, and particles has historically impacted our fragile layers of technology augmenting our Mother Earth's already delicate magnetic and atmospheric "skin." Of course, a good question here would be to determine if all the hype around 2012 means that we can expect anything above our "normal" disturbances in radio, satellite, and electrical grids. Certainly, barring any increase in solar output, we may see nothing more a heightened perception of inconvenience, likely due to the increased volume of XM/Sirius subscribers, wireless communications, etc. Time will tell, and we have only the time we are given. Whatever is to become of this, I would certainly welcome any follow up as to the official start of the new cycle, and any early indicators of the strength we might predict at the peak given specific precursors (early flares, sunspots, etc.). End of Solar Cycle 23, already a mystical number, 23 chromosomes... I wonder what 24 shall bring? Here is an I Ching reading for 23. The dark lines are about to mount upward and overthrow the last firm, light line by exerting a disintegrating influence on it. The inferior, dark forces overcome what is superior and strong, not by direct mens, but by undermining it gradually and imperceptibly, so that it finally collapses. The lines of the hexagrams present the image of a house, the top line being the roof, and because the roof is being shattered the house collapses. The hexagram belongs to the ninth month (October - November). The yin power pushes up ever more powerfully and is about to supplant the yang power altogether. The right behavior in such adverse times is to be deduced from the images and their attributes. The lower trigrams stands for the earth, whose attributes are docility and devotion. The upper trigram stands for the mountain, whose attribute is stillness. This suggests that one should submit to he bad time and remain quiet. For it is a question not of man’s doing but of time conditions, which, according to the laws of heaven, show an alternation of increase and decrease, fullness and emptiness. It is impossible to counteract these conditions of the time. Hence it is not cowardice but wisdom to submit and avoid action. The mountain rests on the earth. When it is steep and narrow, lacking a broad base, it must topple over. Its position is strong only when it rises out of the earth broad and great, not proud and steep. So likewise those who rule rest on the broad foundation of the people. They too should be generous and benevolent, like the earth that carries all. Then they will make their position as secure as a mountain is in its tranquility. Inferior people are on the rise and stealthily begin their destructive burrowing from below in order to undermine the place where the superior man rests. Those followers of the ruler who remains loyal are destroyed by slander and intrigue. The situation bodes disaster, yet there is nothing to do but wait. The power of the inferior people is growing. The danger draws close to one’s person; already there are clear indications, and rest is disturbed. Moreover, in this dangerous situation one is as yet without help or friendly advances from above or below. Extreme caution is necessary in this isolation. One must adjust to the time and promptly void the danger. Stubborn perseverance in maintaining one’s standpoint would lead to downfall. Here the splitting apart reaches its end. When misfortune has spent itself, better times return. The seed of the good remains, and it is just when the fruit falls to the ground that good sprouts anew from its seed. The superior man again attains influence and effectiveness. He is supported by public opinion as if in a carriage. But the inferior man’s wickedness is visited upon himself. His house is split apart. A law of nature is at work here. Evil is not destructive to the good alone but inevitably destroys itself s well. For evil, which lives solely by negation, cannot continue to exist on its own strength alone. The inferior man himself fares best when held under control by a superior man. Superior man in this sense I believe refers to the balanced yang energy/our Higher Selves. Very interesting reading! just wanted to follow-up and keep everyone posted...this is the official confirmation of our new Solar Cycle 24!! I watched a lot of utube video's that Ian Xel Lungold presented. They were great. I bought his calender and found my galactic tone is thirteen and sun sign is the sun. I still don't know how to utilize the calender yet. Is it true that these solar cycles have the same duration as what is known as an age, or aion? You know, like the length of time of the age of Pisces, Aqarious, etc.? Or are they actually the same thing? Maurice Coterell wrote the above book which I read back in '98. 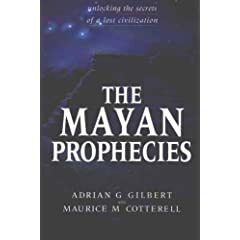 It is no longer in print but I advise snatching up a copy due to the extraordinary information presented.He explains & theorizes that the Mayans were well aware of the Sun Spot Cycles and even points out many Mayan/Aztec statues that seem to be contorted or deformed. Coterell speculates that these deformities were probably a result from over-active sun spot cycles that somehow mutated the DNA of the native peoples. If the Earth is bombarded by solar winds, gamma rays and a host of other energies from the sun, then increased solar activity may begin to trigger these defects and mutations. I hope it's about evolution and not about depopulation! If you do not have the book I highly advise you get a copy. It is a true gem shining in the dark mystery of 2012. I certainly wouldn't put it past the Mayans to know about solar cycles, especially since isn't there grand cycle almost exactly 1/4 of a galactic procession? the zodiacal ages are determined by which zodiac sign is rising on certain dates (like solstice or equinoxes?) and this doesn't change for a much larger scale of time, because this is due to the slower precession of the earth's wobble. Also, Bhang if i'm not mistaken, is that book you recommend also the same Ian Xel Lundgold mentions in his lectures? i'm am fairly certain that is the same book that he pulls tons of his info from. he is almost a disciple you could say of cotterell. interesting dope on the deformations though...would you happen to have some pics of that? i am not sure about the mutagenics of the EM barrage of a solar peak, but it would provide a great demographic study, if anyone can get that kind of data (birth rates, percent defected/mutated, how, and the measurements of various high-energy particles entering the earth's surface zone). It could be interesting to see what happens. I read some of the comments and people seem to be ranging from "the world's gonna end" to "pfft, where's ma craft dinnah?" I think it could range from anywhere in between depending upon your state of consciousness. Other unexpected things could be set in motion leading up to this time, an ignored/unperceived variable that alters completely the predicted outcome. I'm speaking of the increased energetic density of our solar system right now. Although I'm largely unlearned in terms of electricity, I think this field will provide a greater potential for something quite profound to occur during this period. It relates as well directly to our consciousness. Consciousness draws its energy from surrounding fields, and is derived entirely from those fields in a a concentrated way capable of self-reflection. It's the seed and the electromagnetic fields are the soil, and I'm pretty sure that as our EM field is shifting, so to will the nature of our consciousness. Also, the fields enveloping Earth are shifting DNA on an extremely subtle level. Perhaps a weakened EM field during these storms will provide a pathway for this energy to reach us. But in the end, who knows?